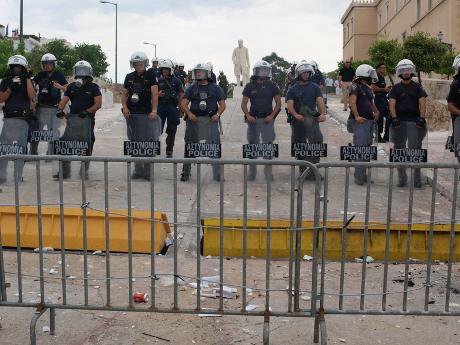 Greek riot police sent in to quash anti-government rallies. Demotix/Craig Wherlock. All rights reserved. Ulrich Beck, in his wonderful book German Europe to be launched at LSE on Thursday, says that Europe was founded not on the logic of war but on the logic of risk. The European Union, he points out, is based on a lot of ‘nots’. It is not a nation, not a state and not an international organisation. States were built on the logic of war. The European Union is a different kind of polity constructed in reaction to the risk of war and now, in reaction, to the risk of economic collapse. Economists argue that the monetary union was a big mistake in the absence of political union. But Beck points out that the point was just the opposite – to create a monetary union that would establish material interest in political union. Without a monetary union there would be no momentum for political union. So far so good. But there is more to this story. In to-day’s Europe, economic and political logics are pulling in opposite directions. It is true that monetary union dictates the need for political union and everyone understands this at élite levels. But the consequences of monetary union and the neoliberal agenda with which it was associated is, at one and the same time, undermining what is known as the permissive consensus and greatly weakening the legitimacy of European élites and with that the European project. This idea that economic co-operation would lead to political co-operation was a central tenet of European integration from the beginning. The founders of the European Union believed that through what was known as ‘low politics’, ‘high politics’ would follow. Economic and social co-operation would bring people together and this would lead eventually to a political union. And during the first three decades after World War II, this argument did appear to have some merit. The so-called Monnet method involved cooperation on infrastructure (coal and steel), agriculture, as well as regional assistance. And small steps were taken in the direction of greater political co-operation. But after 1989, all this changed. On the one hand, this was the high point of the post-1968 cosmopolitan movements – ‘freedom’s children’ as Beck calls them. The coming together of peace and human rights and the end of the Cold War led to a new wave of Europeanism. On the other hand, it was also the coming of age of neo-liberalism. The same critique of the rigidity, paternalism and authoritarianism of the state developed by ‘freedom’s children’ was used by the right to argue for more markets – deregulation, privatisation and macro-economic stabilisation. ‘Freedom’s children’ had taken social justice for granted and in reacting against the old left had opened the space for the new radical right. The 1991 Maastricht Treaty can be regarded as a contract between the new wave of pro-Europeans, championed by Jacques Delors, and the new marketers epitomised by Margaret Thatcher. The logic of the market is very different from the logic of earlier forms of state co-operation. This contradictory union between cosmopolitanism and the market was played out over the last two decades. On the one hand, Europe expanded to the East and developed its neighbourhood policy largely based on the outward application of the Monnet method, using techniques that had been developed in the process of integration to bring in the outside world, extending ‘low politics’ to the neighbourhood and even sometimes beyond. It developed external policies for crisis management and for development similarly organised, albeit often rather bureaucratically, becoming in the process the biggest aid donor in the world and contributing to global debates about climate change, poverty or global security. On the other hand, the rules of the single market and the euro – the so-called convergence criteria – associated with other neoliberal reforms, led to increased inequality, insecurity and atomisation undermining community and/or cosmopolitan politics. What is more, internal security and surveillance, especially on the borders of the expanded Europe contributed to growing mistrust within societies. It is true, as Beck points out, that material interests could force political co-operation. That is the only way to save the euro. But the ‘high politics’ of the European Union is still absent – we only have Merkiavelli. National élites lack popular support and the so-called permissive consensus that allowed continued integration is rapidly disappearing. The fate of the technocratic Prime Ministers, Mario Monti and Lukas Papademos, imposed on Italy and Greece, illustrate the end of this permissive environment. What Europe faces is a profound political crisis. This was the main conclusion of our report ‘The bubbling up of Subterranean Politics’. The protests and demonstrations, the new political initiatives and the new parties, are not necessarily a reaction to austerity. They were and are about a profound loss of trust in current political élites – a belief that these élites are locked into financial and media interests and unable to act on behalf of the public good, and a sense that representative democracy is no longer about participation, but about reproducing that élite. The problem is that in the absence of a bottom-up emancipatory cosmopolitanism, a project of European solidarity, that lack of political trust can easily be manipulated by xenophobic, eurosceptic and exclusivist parties of various stripes. Parties like UKIP, the True Finns, the Dutch Freedom party, New Dawn and similar parties are making electoral inroads in nearly every European country. And the mainstream parties, preoccupied by short term electoral considerations, tend to pander to the sentiments expressed by these parties instead of voicing the longer term public interest. It is very difficult to see how Europe can escape this downwards spiral. The union of Europeanism and monetary stability is so ingrained in the German psyche that it is unlikely that a German Europe, led by what appears from Beck’s description, an apolitical pragmatist, would ever change course. The lack of bottom-up pressure at a European level, the weakness of trans-European solidarity, the fragmentation of subterranean politics, all hint at dark political tendencies. Far from being an exception, a marginal oddity, Greece could represent the future for much of Europe. What is happening in Greece is typical of what I call a new war. Dramatic cuts in public spending weaken state capacity and further erode trust and legitimacy, providing a space for a combination of criminality and extremist politics. Such a combination is self-reproducing, since those involved profit from disorder. It is thus very difficult to end or to contain and a new type of predatory political economy that knows no formal borders comes into being. The only answer is cosmopolitan political authority but where is this to come from?